Sarah EA Parkin is known for her watercolour landscapes of the Derbyshire Dales. She tends to paint the ‘less seen’ views of local places around Matlock including Ashover, Rowsley, Chesterfield & Wirksworth. Looking, in particular, at the way the built, man-made environment with it’s the geometric shapes and structural lines, sits within the undulating, organic landscape. She keeps the sense of place, sometimes being more descriptive, yet responds in an expressive, informal manner. Brought up in the flatlands of North Somerset with lots of sunsets and cycling in the countryside, she enjoyed drawing from an early age, especially of nature. She discovered a love of art and its history, and travelled to see works by Renaissance artists in Italy, Matisse in Nice and Monet in Paris. Her love of colour and drawing found an outlet when she chose to do Printed Textile Design at Derby, and then an MA Birmingham. At UCE & in Taiwan, she studied Oriental painting and Chinese ink scrolls. During those studies, she received two awards and worked in French & Italian studios. 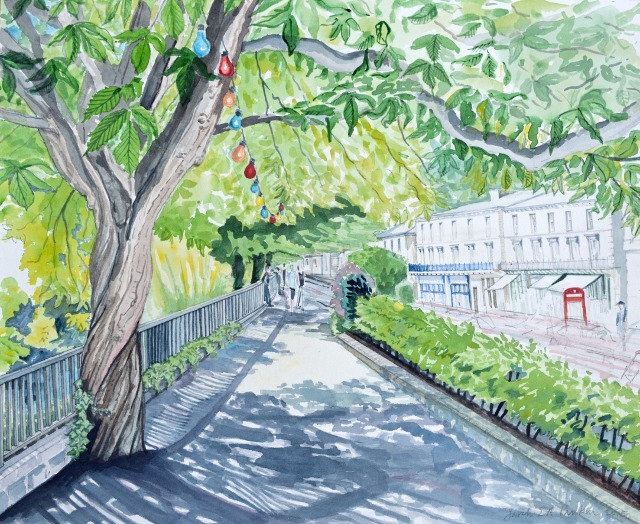 After completing in 1997, she came to live in Derbyshire, setting up a textile design business, clients including Paul Smith & French Connection. Landscapes did begin to emerge at this time as a creative escape. When children came along, she became increasingly drawn into the surrounding landscape and the freedom that this subject brings. 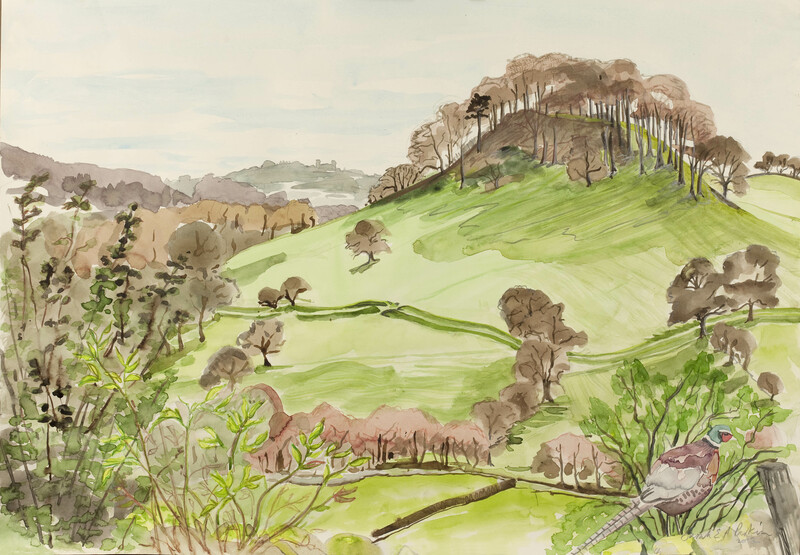 Encouraged by friends to make reproductions of her work, and with offers for exhibitions based upon these coloured sketches, she dared to begin on the path of a landscape painter. She started using large quantities of ink as she had done with the floral textile work, she then moved onto using more light-fast watercolour. She likes to see the drawn pencil marks, the fast movement of a Chinese ink brush, or a hint of a scratchy dip pen. She has increasingly formed a strong bond with the area; its soft rolling hills, dramatic cliff faces and surprise town vistas, tree-lined hills and parks. She prefers to work outdoors to get a feel of the view; the atmosphere & rhythm when immersed in it. Sometimes figures flit into the work. For her, though, it is important that those figures don’t dominate but integrate into the natural environment. Capturing a season, a weather moment, a snowy scene, in particular, has a strong appeal. Singular or groups of trees, often form an important part of the composition or subject matter, such as the Oker tree or Peak Tor. 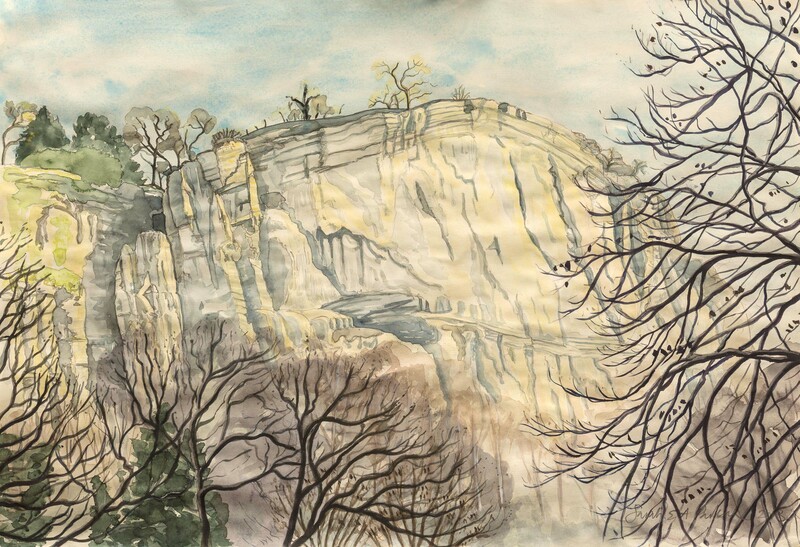 Sarah has found resonance in the landscape work of Paul Nash, Eric Ravillious, and David Hockney. ‘High Tor in Winter Light’ won Commended in Derbyshire Open Competition. Sarah is twice a prize winner (2014 & 2015) Matlock Bath ProLoco and exhibited at various places around the area. Artworks have been bought by clients around the world. Fine art reproductions, originals and cards are available, along with items such as mugs. She is very grateful for the local businesses and people who form part of her 'production team'.